It’s National Bittersweet Chocolate with Almonds Day, in these United States. So – last week I had a few things to do over in the Hunters Point section of LIC on a particular afternoon. A short and rapid scuttle ensued, one which saw a humble narrator hurtling south towards Skillman Avenue in a staggering pursuance of arrival in certain points found westwards of the almond eyed Astoria he calls home. Avoidance of perambulatory transit through Queens Plaza has become a “thing” for me, as the alternative route – using Jackson Avenue – is less visually interesting, and is also a somewhat harrowing journey on foot due to omnipresent construction and heavy vehicular activity. Besides – I have zero opportunity to shoot shots of trains using the Jackson Avenue route, and I know where just about every hole in the fenceline along the Sunnyside Yards can be found. 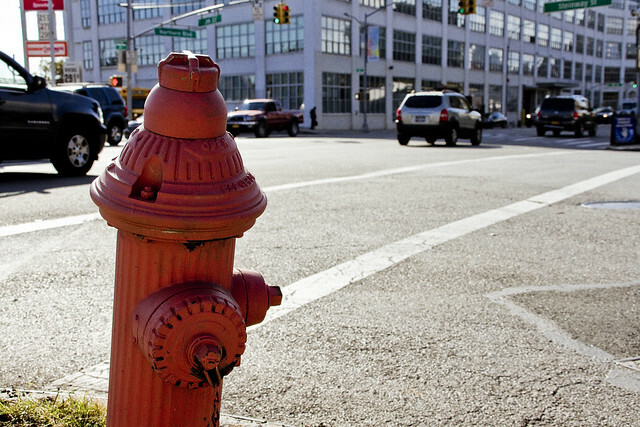 I always advise those dear to me to “stand behind something” while waiting for the traffic signals to change and allow access to cross this Northern Boulevard, I would mention, so in the interest of practicing what I preach – one ducked down and cowered behind a fire hydrant (pictured above). 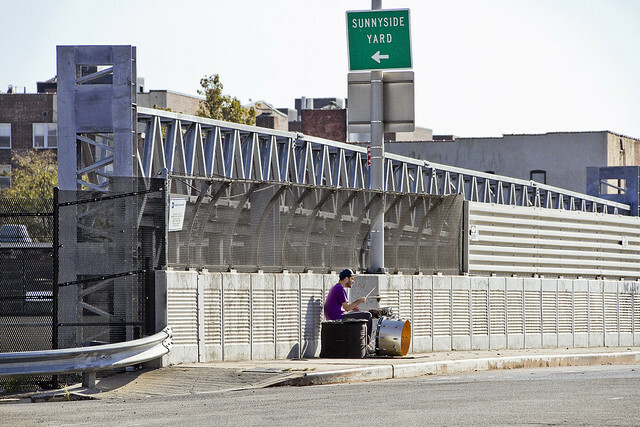 OK – Steinway Street in Astoria is analogous to 39th street in Sunnyside, and the two are connected by one of several truss bridges that span the Sunnyside Yards. It’s actually fairly “good cardio” walking over the 39th street span if you lean into it and push towards the apogee of the thing. At the top of the arch, there’s a worker access road that would carry Amtrak and other railroad employees down into the railyard, and that’s where I spotted a percussionist practicing his craft. 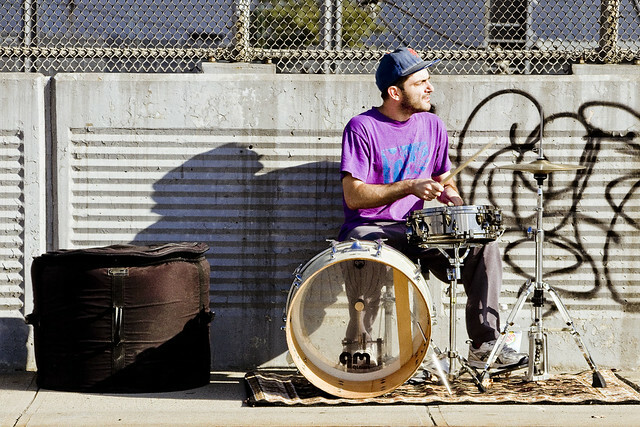 Observedly – It was a three piece drum set which this gentleman had set up for himself, and despite having noticed a humble narrator photographing him, he never skipped a beat. Y’know – This sort of drum kit is relatively modern in origin, and whereas it is quite familiar to modern eyes, it was only originated in the 1860’s. It’s called a “trap drum” or “double drumming” kit, and prior to the semi modern era, each one of the instruments on view (base, cymbal, snare) would have required an individual musician to operate. The trap drum innovation was conducive to the development of the musical schools of ragtime, jazz, and rock-n-roll, I’m told. Then – Although I wish I could tell you that one got caught up in the wild al fresco rhythms offered by this anonymous percussionist, as mentioned at the top of the post – I had things to do and places to be. 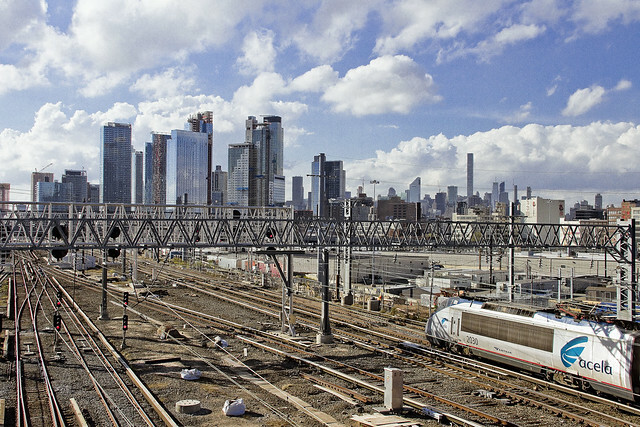 Utilizing one of those aforementioned holes big enough to stick a lens through – in the fences of the Sunnyside Yards – and which I keep a constantly updated mental map of, to capture a shot of Amtrak’s Acela train passing through the Harold Interlocking on its way towards Manhattan. It’s the busiest train junction in the United States, actually, the Harold Interlocking. The Mayor wants to build luxury housing upon a deck on top of it. Please vote for someone else today. Ultimately – I had places to go, and headed west into the setting sun, scuttling along with a camera in hand.